On Wednesday, December 14 Chef Matt Taylor of Gertrude’s, the highly touted full-service restaurant located just inside the Desert Botanical Garden, is welcoming Robert McGrath to the kitchen for an intimate evening at the Chef’s Table with incredible food, delicious wine, and one-on-one time with two great chefs. The event starts at 6:00. The seven-course dinner with wine costs $175++ per person. A credit card is required to reserve a space. Call 480.719.8600 for reservations. Robert McGrath is one of America’s finest chefs and restaurateurs. 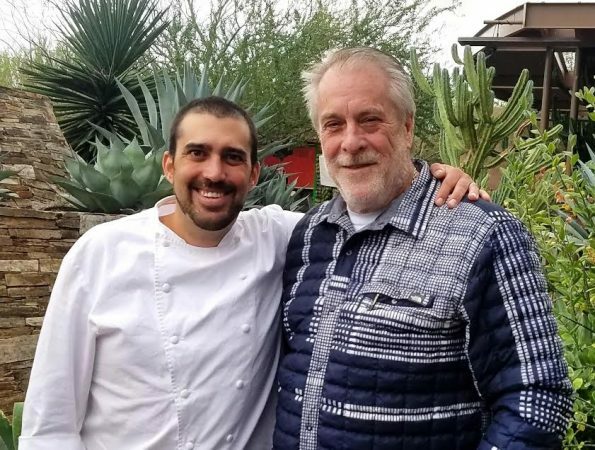 Winner of the prestigious James Beard “Best Chef in America: Southwest” Award, and founding chef of both Roaring Fork and Renegade Canteen restaurants in Scottsdale, Arizona, McGrath has been a nationally acclaimed chef for nearly two decades. Gertrude’s offers diners top-quality seasonal menus and libations that showcase local ingredients from artisans and farmers. Gertrude’s dining experience pairs delicious cuisine with lush desert ambience. Garden admission is not required to dine at Gertrude’s. Reservations can be made on Open Table (www.opentable.comfollowfollow) or by calling 480.719.8600. ← Previous Previous post: Devour Culinary Classic Tickets Now On Sale!